Tyrone Hibernians have raised the profile of a community’s fight against an international gold-mining company that wants to build a processing plant using cyanide to extract gold from ore mined in the Sperrins. The County Board of the Ancient Order of Hibernians has confirmed that a meeting took place between members of the Tyrone A.O.H. and the New York State Comptroller, Thomas DiNapoli, his Chief of Staff Shawn Thompson and Patrick Doherty, Director of Corporate Governance. The chief item on the agenda was the struggle between the people of Greencastle and the Canadian gold-mining company Dalradian. In November, a new AOH branch, named the ‘The Molly Maguire Division’, was set up in Greencastle by local people opposed to the company’s mine plans. According to a spokesperson for the AOH, the meeting with the New York officials was extremely friendly, business-like and productive. 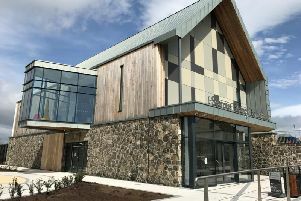 “The Comptroller and his team, who were already well-informed on the issue, listened intently to a brief presentation by a member of the Greencastle Molly Maguire A.O.H. Division and afterwards asked a number of very relevant questions”, said the spokesperson. “The New York State Comptroller’s Office, which is responsible for over $190bn in investment funds, is committed to monitoring the situation and an on-going liaison contact has been established. “The Tyrone A.O.H. has expressed its gratitude to the Hibernian network on both sides of the Atlantic for having facilitated the meeting. The Tyrone A.O.H. has called on Sinn Féin to publicly clarify the party’s position on the matter.